Have you seen the N1MM Logger+ Spectrum Monitor? Not too long ago N1MM came out with a spectrum monitor for a limited number of radios. Fortunately the IC-7300 is included in the list of supported radios. The N1MM Logger+ Spectrum Monitor, sometimes called Spectrum Display, is a nice addition to N1MM Logger Plus and it works very well as I discovered during a RTTY contest. Even if you don’t contest N1MM Logger+ can be used as a general logger. I like using it and MMTTY for RTTY (FSK). Icom IC-7300, IC-7850/51, Icom IC-7610. Flex 6300/6400/6400M/6500/6600/6600M/6700 Radios Supported via CAT and UDP. Yaesu FTDX5000, FTDX3000, FTDX1200, FTDX9000. More information on the supported radios and the interfaces can be found here on N1MM Loggers website. I try to keep it consistent and the Icom 7300 menu settings stay pretty much the same. So whether you are using one cable or two, these will work. BTW, for this setup I am only using the USB cable. Here are some screen shots of the Icom 7300 menu settings under MENU>SET>Connectors. If you ever have a question about this or if it’s not working for you, please shoot me an e-mal or comment below. 1. Icom 7300 Menu and Connectors (Using one USB cable). 3. N1MM Logger and Configure ports. 4. Spectrum Monitor and various settings. 5. I forgot, but hold down the Ctrl key while clicking in the waterfall and it will put you in SPLIT mode! Yes I believe that is dependent on the log that you have open. If you are using a general DX log as opposed to a contest log, then I think they will all show up if you cycle through the modes with the radio. I hope that’s what you’re looking for and thank you again for commenting here. “Window->Digital Interface” really works ). But I mean a little different: I have only 2 modes columns (with the bands) at the main N1MM window – CW, PH. And CW, PH, RTTY, PSK are on the video. Please, could You tell me, how can I turn on RTTY/PSK at the main window of N1MM? Now I have only CW/PH. Go to Menu. Click Window and then Digital Interface. Thank you for the comment and good to hear from you. You must be looking at the Entry window. The boxes or Macros, should be there. I don’t think I’ve ever seen them disappear. Is that what you’re looking for? 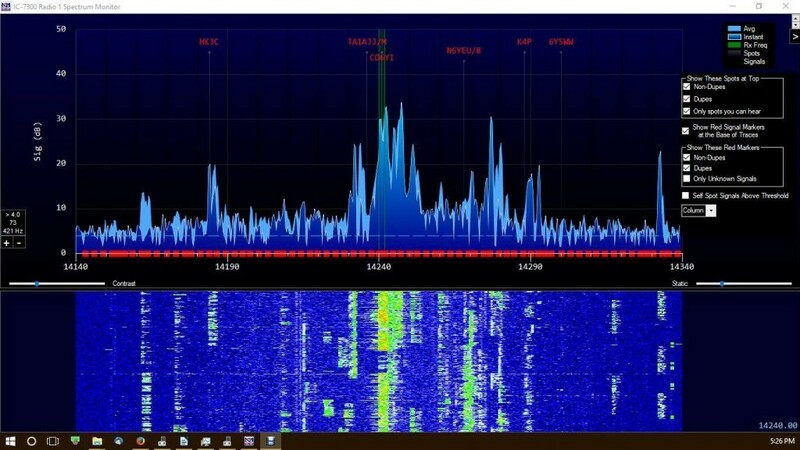 The frequency, or band display I have showing in the Entry window on the left shows up if you choose a general log or DX for Log Type. Go to File>New Log in Database and then select the DX for the File Type. I think that should do it. Let me know about the Marcos. There must be a setting off somewhere if they don’t show for you. Thanks for coming by my website and have a great day!